When Alisun Bonville moved from Portland, OR to Bozeman, Montana, to start a new naturopathic clinic, she needed a high-quality website and social media presence that would be online and ready in time for her grand opening. 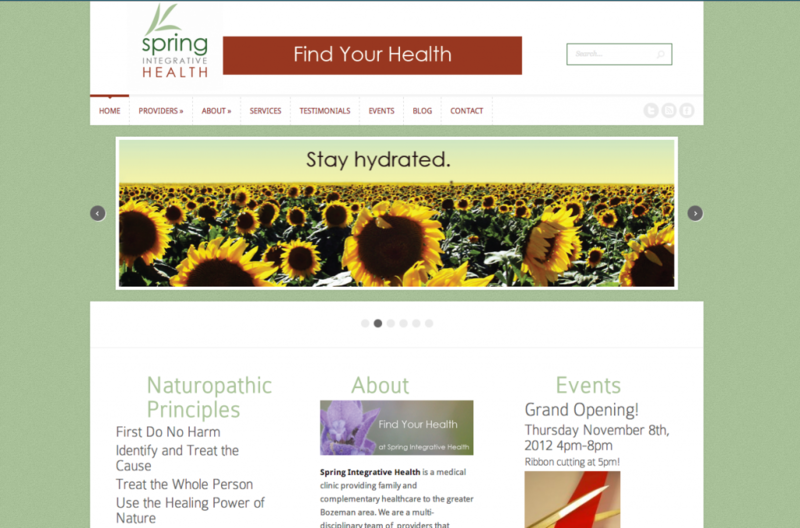 The naturopath website she wanted serves as a centerpiece of her online presence. We set up a full social media suite for her, and aggregated the posting channels together, so she could maintain activity on her Tumblr, Pinterest, Twitter, and Facebook accounts by posting only once. We also set up a newsletter to announce her website to her colleagues, and got her social profiles populated with plenty of likes and follows right away. 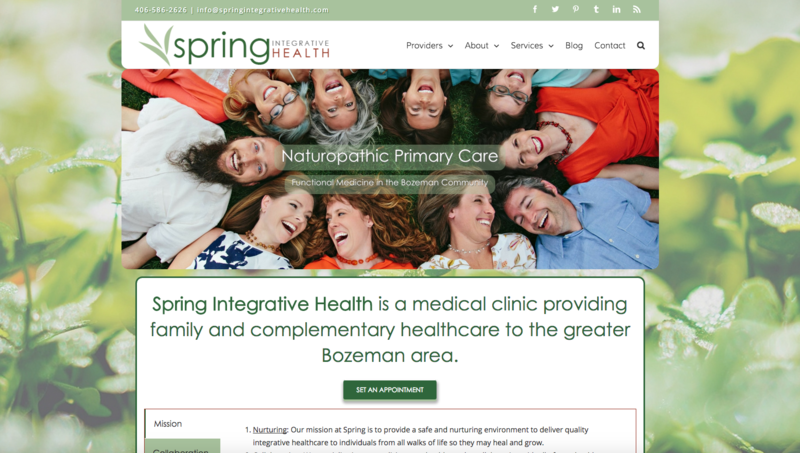 Spring Integrative Health offers lots of different services – primary care medicine, holistic nutrition, naturopathic oncology, Bozeman acupuncture, BodyTalk, family counseling, and more. After four years, the Internet changed. Responsive website design became more important. The sitespeed of her old site was beginning to affect her SEO. So, we redesigned the website for her naturopathic clinic with one of the latest cutting-edge responsive WordPress themes. We used updated professional photos of the clinic, the practitioners, and treatments in action. We also used high-quality stock photography for featured images of the blog, giving a much more pleasing scrolling experience. As an integrative wellness clinic, Spring Integrative Health provides a suite of different services, from nutrition counseling to massage to acupuncture to primary care, with a naturopathic doctor. The integrative medicine approach gives everyone in the clinic the perspective that healing the patient may take a number of different practitioners or therapies. No one provider tries to cure a patient themselves, but instead consults with the other providers in the clinic to collaborate on healing the patient, together.